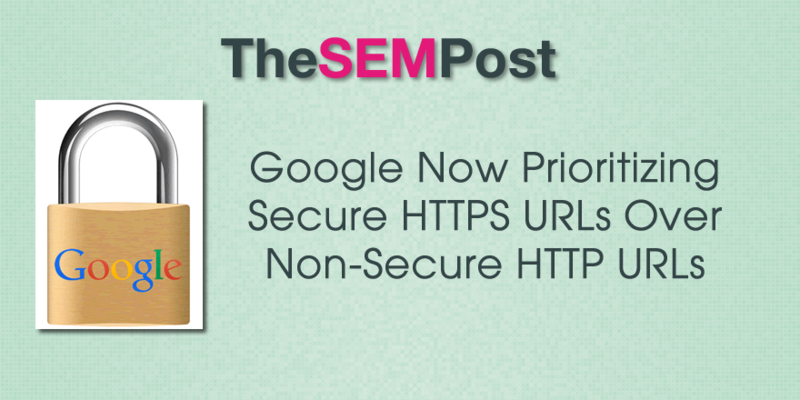 Google has announced that they will now be giving preference to secure HTTPS URLs on websites over non-secure HTTP URLs. Zineb Ait Bahajji made the announcement on the Google Webmaster blog detailing the change. This also makes sense as there have definitely been instances where sites switch to HTTPS, but don’t implement correct redirects, so Google could still serve the older grandfathered HTTP URLs. While Google is still recommending redirecting HTTP URLs to HTTPS ones, this change will mean that once Google discovers the secure pages, it will use those over the non-secure ones in certain circumstances. The addition of the insecure dependencies is a significant one, as this is often where websites run into problems, usually by displaying non-secure elements such as advertising or some social media share buttons, often without realizing it is an issue. Google has really been pushing for secure sites over the past couple of years, particularly with their ranking boost for HTTPS, something they plan to make stronger in the future. So it isn’t surprising to see Google make these changes to prioritize HTTPS, especially for those webmasters who might not make the switch to HTTPS as seamless as possible. Before SEO’s misinterpret Google Prioritizing Secure HTTPS version. Its for sites that turn on HTTPS but don’t implement correct redirects. Google will by default try the HTTPS version first.